If you’re wondering what we mean by “best modern office chair,” then read on! This is a list of chairs that are stylish, cutting edge, have clean lines and don’t use traditional, classic styling. Because there are so many innovative, tech-savvy and design-focused companies out there, you not only get a great looking chair, but a high-functioning, feature-rich sitting experience. These chairs will add quite a bit of style to any home or office, while still keeping you comfortable and supported while seated. First on the list is the Flash Furniture high back ribbed chair. This is actually the most stream-lined and simplest in appearance option on our list. While not the most unique looking piece, you can tell that it definitely looks and feels modern. Visually, it is pleasing to the eyes and makes you feel instantly comfortable when you sit in it. 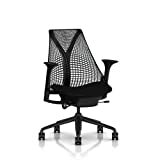 This is a high back swivel chair that has a foam-molded seat and back with built-in lumbar support. The chair is available in 2 tones – black and white. Selecting the color will depend on your interiors but I highly suggest getting the black one as the maintenance of the chair won’t be nearly as intensive as getting a white one. This chair in either color will make your surroundings look stylish and modern. If you aren’t a fan of high back chairs, this chair also has a mid back version that might be better suited to your preferences. We have found that the comfort and support of this chair is just average. There’s nothing terribly outstanding about this chair, besides its appearance and price. Two extra features we do like about this chair is that is has a coat rack on back of the chair, which is very useful during jacket season. It also features dual paddle controls to easily adjust your chair. Assembling this chair is really easy and you won’t encounter any hardware problems. You can score this chair on Amazon with a rating of 4.1 out of 5 stars. It’s a leather chair, so that might be a make or break feature for you. This chair doesn’t have your normal foam or cushion seat, so it is more popular with those who prefer stiffer chairs. Second in our line up of great modern chairs is the Embody chair by Herman Miller. This is the most expensive one of the bunch, but is also the most fresh, modern-looking option equipped with the best features. The Embody chair was made specifically for people who work for hours on their computer. Herman Miller worked with more than 30 professionals who have contributed their knowledge and expertise to the design of the chair. The back of the chair is composed of a dynamic matrix of pixels that looks like a spine. This was done intentionally because the Embody chair was designed to adjust automatically to the movement of the person sitting on it, keeping the spine aligned and healthy. This chairs seat depth also adjusts to different thigh lengths and the armrest motions fit the broadest ranges. The feel of the textile is actually quite nice and the cushy feeling is great for the back. This is like the Aeron’s next generation brother with better ergonomics and full back support. The one complaint most people actually have is that the controls and settings are a bit complicated but once you get used to it. The money you spent will feel like an amazing investment for a better posture and ultimately a better lifestyle. The tilt technology on the Embody supports 3 zones – thighs, sacrum, and thorax. The chair prevents uncomfortable pressure on your legs and arms and keeps you very relaxed. Aside from this zones, Embody encourages healthful posture with its backfit adjustment which positions the backrest in line with your spine’s natural curve keeping you free from back pains even while you sit for long time. So when you move your chair, your head will still remain aligned to your computer. This chair is also made up of 95% recyclable materials. Embody also comes in 4 different colors (black balance, black rhythm, carbon balance and iris balance) to fit your interior design. Herman Miller chairs also has a 12 year warranty which shows how dedicated and great their service is. This warranty covers everything that makes this chair including casters, tilts, pneumatic cylinders, and all moving mechanisms. Because of its tilt technology, this chair boosts your creativity since movement promotes blood and oxygen flow, which keeps the brain more focused and functional. So if you are looking for a modern chair that helps you be more productive and comfortable, this chair might best fit you. It is listed on amazon with a 4 star customer rating. Although the price is a over a thousand bucks, it is still a great investment because of its good insurance, service, durability, modern design and features, it is definitely worth every penny. 12-year Herman Miller warranty with Born-On Date sticker. Next on our list is actually the SAYL chair by Herman Miller. In the furniture industry, Herman Miller is one of the most well known brands around. Known for their quality and features, this SAYL chair is no exception. Words are not enough to explain how beautiful this chair is. It is unique to say the least. The people over at Herman Miller set out to create a modern design at a good price. The chair features 3D intelligent suspension technology. Meaning the support is molded directly into the 3d intelligent back material. If that seemed like a lot of mumble jumble it just means this – there is less tension in other parts of the back, which encourages a full range of movements. Designer Yves Behar was the one who designed this SAYL chair and was inspired by the Golden Gate Bridge in San Fransisco, where he is based, to create this unique chair. Herman Miller prided themselves in making this eco-dematerialised chair design, which means that they made the most of the materials in inventive ways. Which ultimately means less cost and smaller carbon footprint. The Two innovations of this chair is the state of the art Arcspan and the Y tower. The Arcspan function shapes the back and anchors the suspension fabric, while the Y tower is the backbone that stretches the fabric and provides support for the back. The mesh back makes it very breathable and cool. While it is quite a bit of money, it is a Herman Miller chair, which only means that it is aesthetically pleasing, ergonomically designed, and economically friendly. The chair is definitely solid and very lightweight. The lumbar support that it offers is ok as some people find the back a bit too stiff but keeps you in proper posture all the time. The SAYL chair is actually available in a bunch of options – fully adjustable arms, fully adjustable black and lumbar, and fully adjustable aluminum black and lumbar. The basic model comes with a tilt lock, which gives you the ability to recline or keep the chair upright. If you can afford it, I recommend this chair as it definitely has an eye-catching design with great lumbar support. It is a bit expensive though but well worth your money. I will recommend though that you go out and try the chair out for yourself. This “life unframed” chair is an amazing mix of sophisticated engineering, design and ergonomics that promotes a real sense of seated freedom.